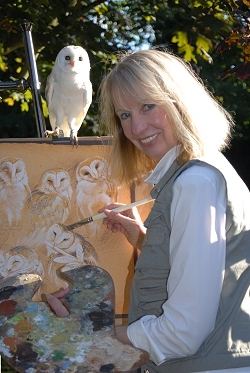 Pollyanna is acclaimed as one of Europe's foremost wildlife artists. The most published artist in the UK, her work sells in over eighty countries world-wide. Her original paintings have been exhibited to critical acclaim in top galleries throughout the UK and Europe, including the Royal Academy. She has her own gallery in the Peak District of Derbyshire where she lives and works. She is a signature member of Artists for Conservation (Canada), who recently awarded her a fellowship in support of an expedition into the Himalayas, and The Society of Animal Artists (New York), and is a patron of The Wildlife Art Society International . In 2008 Derby University award her an honorary degree in recognition of her outstanding achievements in the arts. For fifteen years Pollyanna ran a registered hospital for birds of prey from her home. 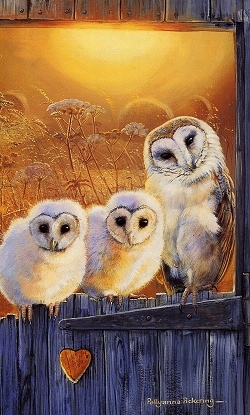 Caring mainly for injured and orphaned raptors, she also rehabilitated foxes, hedgehogs, squirrels and other mammals, all of which feature in her work. Her third book 'A Brush with Wildlife' tells the story of the sanctuary, and the paintings inspired by the close contact with the creatures in her care, which is reflected in the realism and vitality of her work. Pollyanna's determination to paint only animals which she has observed in their natural habitats has lead her into a remarkable and unique series of journeys into some of the most inhospitable areas of the globe. Her expeditions to study threatened species have taken her across five continents, from the jungles of India to the deserts of North America, and the wastelands of Siberia where she painted the threatened Amur Tiger. She has painted in the rain forests of Central America, and the forests of Transylvania. The award-winning book 'Giant Pandas and Sleeping Dragons' was inspired by her travels in the Tibetan Borderlands of China in search of the giant panda, while 'On Top of the World' tells of her expeditions into the High Arctic to paint polar wildlife. Pollyanna's skills as an artist, and her journeys into remote, inhospitable and often dangerous areas of the world attract much media attention. She was voted Speaker of the Year in 2004, and has also become a familiar face in the national press, and on television and radio. Pollyanna, who studied at the London Central School of Art, has received many awards for her paintings including a fellowship from the Canada based Artists for Conservation Foundation, the Millennium Trophy and two gold medals bestowed by The Wildlife Art Society International. She has received a commendation for her work in the Arts at the European Women of Achievement Awards. She has also been recognised for her achievements in both business and conservation with awards including the International Fund for Animal Welfare Conservation award presented at the House of Lords, and several major business awards including the Natwest everywoman award and the Department of Trade and Industry Award for Export. Pollyanna acts as patron of several national charities including, The Badger Trust, Naturewatch, Raptor Rescue and the African/ Asian Conservation Trust. In 2001 the Pollyanna Pickering Foundation was established, to raise funds for world-wide conservation, animal welfare and disaster relief.